Students often take advantage of summer courses to receive credit in a compressed amount of time and effectively use block tuition. Those summer courses can sometimes be a little more creative in the way they are taught – even in deciding the location for the class. MGMT 320: Social Entrepreneurship is no exception to that rule. 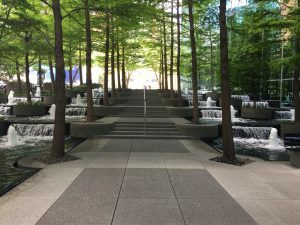 Social Entrepreneurship is taught at City Square in downtown Dallas by Dr. Laura Phillips over the course of five days. Business students are not the only students who take the class. Phillips says, “The social entrepreneurship course is appropriate for business majors and non-business majors alike. We’ve had students in the class who are studying art, English, architecture and political science – just to name a few. It’s also relevant for students at different points in their academic career. I’ve had students who just finished their first year of college in the class as well as students who are taking it as their very last class. It may seem overwhelming to squeeze an entire class into a week, but it’s an engaging and inspiring week!” We asked a couple of the students who completed the course to tell us a little about why they chose to take the class and what they took away from the week. Tell us a little bit about the format of the class. What was a typical day like? Tell us about some of the speakers and/or experiences that stood out to you? What was your favorite thing about the class? What surprised you the most about the class or any of your experiences in the class? Social Entrepreneurship at CitySquare is pushing students to think outside the box and time again, they state how much they love the class. How about the professor? We asked Dr. Phillips a few questions about the course as well. What is your favorite thing about teaching the class? I know you have many speakers that come in to talk to the students. Who are some that have made a big impact on the students? What do you hope students will take away from the class? The College of Business seeks to inspire, equip, and connect students to honor God and bless others. We can’t wait to see what these students do to change the world. Any student wanting to learn more about the next offering for MGMT 320: Social Entrepreneurship can contact their academic advisor or Dr. Laura Phillips.